The Young Planning Professionals’ Programme is a crucial component of ISOCARP’s dedication to promote and enhance the planning profession and commitment to facilitate knowledge for better cities with the young generations, the future leaders of our profession. Since 1991, it has facilitated a unique creative spirit within the Society, and it has become a source of new ideas, innovation and rejuvenation not only for the Society but also for our partners, and made a huge impact on participants’ professional lives, in the name of the universal vision of promoting and enhancing the planning profession. It has also contributed towards making life-long friendships beyond borders, languages, cultures and professional backgrounds. According to this tradition, the YPP workshop will be offered again this year during the 55th ISOCARP World Planning Congress, which will take place in Jakarta-Bogor, Indonesia. The agenda of the 55th ISOCARP World Planning Congress is ambitious. As stated by Martina Juvara, General Rapporteur, “with urbanisation continuing at pace and a globalizing economy, metropolitan areas are morphing into megacities: a different model of urban development, which is no longer the unexpected by-product of fast growing countries – a beacon to be followed for some, and for others simply dehumanizing”. Regarding this agenda, the congress focuses on investigating the future and the opportunities offered by these cities without limits, exploring their supposed inevitability but also on the possible alternatives for achieving global influence without the mega-scale – by exploring ‘planning beyond limits’. 2019 Jakarta Young Planning Professionals’ Workshop contributes to this ambitious agenda with an ambitious programme on Planning Beyond Limits – Building Livable Communities, and uses Jakarta and Bogor as urban laboratories to explore the beyond of metropolises and limitless cities. Jakarta, which is inhabited by 9.6 millions city dwellers, is a very strategic city. The capital city of Indonesia is the centre of government’s administration as well as of business and industry. Studies show that 70% of capital in Indonesia is perpetuating in Jakarta – underlining its pivotal role as Indonesia’s primate city. It is the second largest agglomeration in the world (over 30 million), one of the biggest plastic waste generators (up to 2,400 tons daily) and the fastest sinking city (up to 15 cm a year, with almost half the city below sea level already). Almost 40% of Indonesian citizens, though, are dissatisfied with the living quality of the cities in which they live, according to the recently released 2017 Indonesia Most Livable City Index by the Indonesian Association of Urban and Regional Planners (IAP). This workshop will focus on handling the condition of livable, accessible and mobile communities in two transit-oriented development (TOD) areas at the TOD Dukuh Atas, Jakarta and TOD Baranangsiang, Bogor. These case study areas will offer the potential to rethink livability in Jakarta and Bogor based on mobilities and particularly on transit-oriented development in accordance to connectivity, diversity, quality, accessibility, mobility, sustainability and resilience. The teams will be supported by the Association of South-East Asian Nations (ASEAN) Young Planners Group, Bandung Institute of Technology and Universitas Tarumanagara and Malaysian Institute of Planners (MIP). ISOCARP is looking for two COORDINATORS for the 2019 YPP Jakarta workshop. Coordinators have to be ISOCARP members. Since this is an activity attached to our congress, there will be no honorarium for the YPP Workshop coordinators. On the other hand, it was agreed that the congress fee would be waived for the workshop coordinators – as a reward for their work and involvement in the YPP programme, which constitutes an important part of the congress. Local host IAP will be in charge of arranging accommodation, boarding and local transportation for the entire duration of the workshop within the agreed dates. IAP will also arrange accommodation for the duration of congress (Information on the hotels will be out soon). ISOCARP will not be able to provide any assistance with respect to international travel expenses. 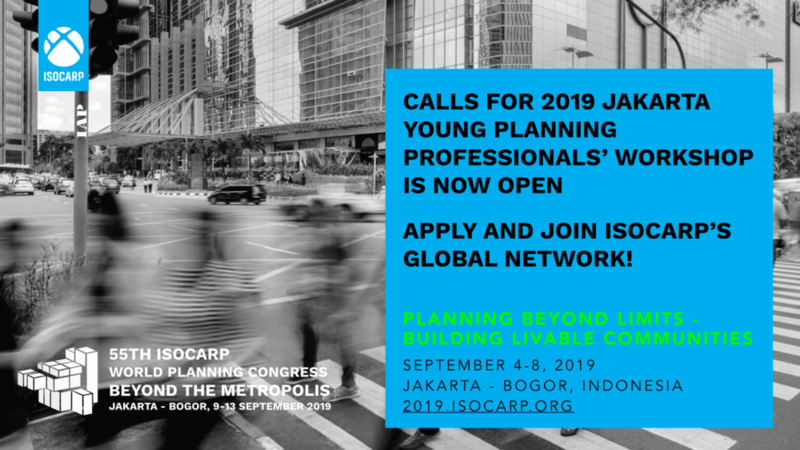 ISOCARP is looking for 25 YOUNG PLANNING PROFESSIONALS for the 2019 YPP Jakarta workshop. The call for WORKSHOP PARTICIPANTS (YPPs) is open to YOUNG PLANNING PROFESSIONALS – professionals or Masters/Doctorate students in Planning, Urban Design, Policy Development, Geography, Architecture, Social and Political Sciences, or another related discipline. Young Planning Professionals, who are not older than 35 years, with experience in urban design and planning, transit-oriented development, strategic planning, social, economic and environmental sustainability, livability as well as resilience are especially encouraged to apply. A clear scan of the passport (photo page) and information whether you need a visa to Norway, and – in the positive case – which country/city/consulate you will be applying. The cost of modest accommodation in shared rooms for the entire duration of the workshop and congress, as well as boarding (lunches and dinners) and local transportation for the entire duration of the workshop will be covered by the Local Host IAP within the agreed dates (Information on the hotels will be out soon). Transportation from airport to hotel and vice versa will be arranged by participants themselves. ISOCARP can neither be able to provide any assistance with respect to international travel expenses nor waive the congress fee for workshop participants. However, ISOCARP will grant €275 during the congress up to 5 selected international YPPs with proven highest qualifications. ISOCARP has also recently launched initiatives such as YPP Legacy Programme i.e. South Africa to provide grants especially for participants from developing regions of the world. Please check out the availability of grants in your home country. Following the successful hosting of the 52nd ISOCARP Congress in Durban, South Africa, it was agreed that as part of the legacy of the congress forces be joint with the Legacy Committee of South Africa to motivate young planning professionals to contribute to ISOCARP’s future through alternative ways of resource mobilisation and to stimulate collaborative activities. The 52nd ISOCARP World Congress Legacy Committee will therefore sponsor 2 participants from South Africa to participate in the YPP Workshop in Jakarta. Please check out the call above, and approve your application as part of Legacy Programme by ticking the relevant box in online application form.